Though America's "love affair with the automobile" may be showing signs of cooling off due to high gas prices, there is no denying that emotional appeal is still a critical factor in the new-car purchase decision. Current gas prices notwithstanding, many Americans still make new-car-purchase decisions on factors other than fuel economy. And although practicality and fuel economy have increased in importance in the vehicle selection process, it doesn't mean consumers are willing to compromise on performance. Things like exterior design, engine performance, handling, and the quality of the audio system are still the determining factors for many consumers. All of these factors, and more, are measured each year by J.D. 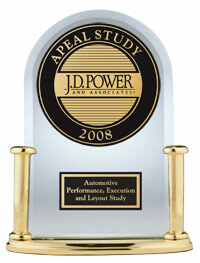 Power and Associates in the firm's Automotive Performance, Execution and Layout (APEAL) Study. The APEAL study measures owner delight with their vehicle's design, content, layout and performance following the first 90 days of ownership. This year's study finds that consumer satisfaction with vehicle performance actually declined slightly compared to last year, primarily due to a decline in satisfaction with fuel economy. For a fourth consecutive year, Porsche ranks highest among all nameplates in the APEAL study, its score improving by 5 index points from last year. Proving that compelling design, strong performance and top quality aren't mutually exclusive, Porsche also ranks highest in the 2008 Initial Quality Study (IQS). Jaguar, with a 3-point improvement compared to last year, ranks No. 2 overall in this year's APEAL study. BMW and Mercedes-Benz rank No. 3 in a tie, though both manufacturer's index scores actually dip slightly compared to last year. Buick, the domestic nameplate traditionally known for its understated designs, is the most improved nameplate in this year's APEAL study, thanks to a boost from its stylish new Enclave crossover utility. Buick's 20-point index score increase was tops among the 36 nameplates in this year's study, as was its eight-position jump in the rankings. Chrysler and Ford divisions also showed large improvements. 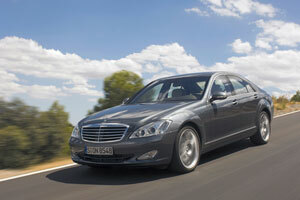 The Mercedes-Benz S-Class is the top-performing model in this year's APEAL study, followed by the Lexus LS and the Porsche 911. The Ford Focus is the most improved model in the study; the Dodge Grand Caravan and Chevrolet Malibu also experience large gains. All three were redesigned for the 2008 model year. Experiencing the largest declines in appeal are the Honda CR-V, Saturn Aura and Lincoln MKX. European nameplates capture eight of the 17 model awards, while Asian nameplates earn six and domestics garner three awards. Honda receives three model awards, more than any other nameplate. 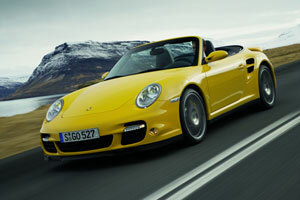 Porsche, Toyota, and Volkswagen each receive two awards, while BMW, Buick, Chevrolet, Dodge, Land Rover, Lexus, Mercedes-Benz, and Mini each receive one award. The Fuel Economy category shows a greater decline in satisfaction than any other in this year's study. With the EPA revising fuel economy calculations for the 2008 model year to reflect more real-world mileage, it is unlikely that the decline in satisfaction is a result of owners' mileage expectations not being met. Rather, the surge in gas prices is much more likely to be the reason for the decline in satisfaction. Surprisingly, "freshened" models outperform all-new or redesigned models in this year's study. Historically, all-new or redesigned models as a group achieve the highest APEAL index scores, followed by freshened models and then carryover models. This year, however, freshened models actually outperform all-new or redesigned models by 6 index points. Scores for all other categories decline year over year, with the exception of Audio/Entertainment/Navigation (AEN), which improves by a single index point, and HVAC, which shows no year over year change. Interestingly, in the 2008 IQS, AEN was the only category with a decline in score.